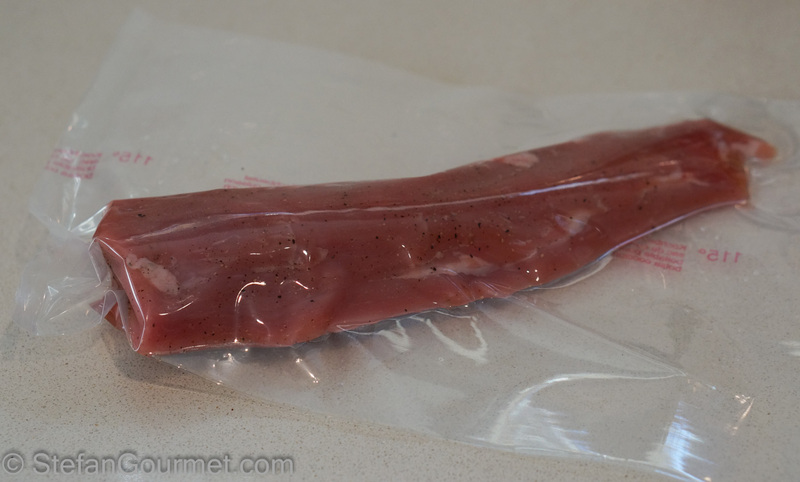 Pork tenderloin is amazing cooked sous-vide, it is the most tender and juicy pork tenderloin you have ever tasted. And it is so easy to do: simply season the pork tenderloin with salt and pepper, vacuum seal it, cook it for an hour or so at 57ºC/135ºF (with sous-vide the exact timing isn’t critical), quickly sear it in some clarified butter, and allow to rest for 5 minutes before slicing. Here I’ve served it with a wonderful Italian-style sweet & sour sauce with sage and garlic that I also use to serve pork medallions cooked the old-fashioned way, and a side of runner beans. 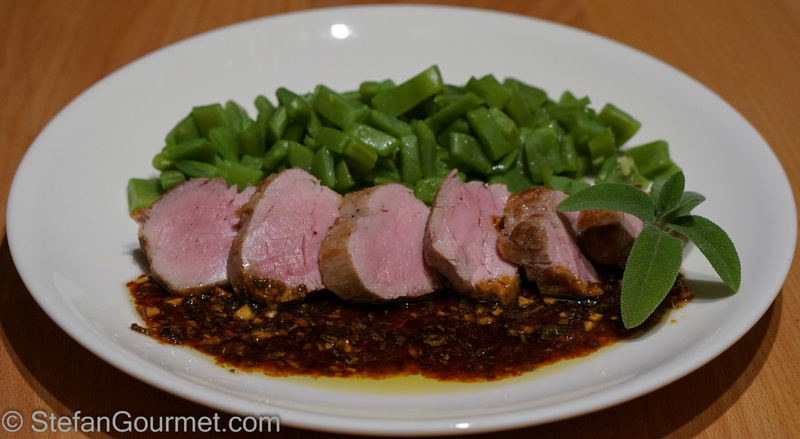 Pork tenderloin is one of the first things I tried sous-vide before I started blogging, and when I realized I had not blogged about it yet I decided to share it with you. If you don’t have a sous-vide cooker, you can either do a poor-man’s sous-vide using a stock pot, ziploc bags, and a thermometer, or sear the pork tenderloin on the stove first and finish it in the oven at 80ºC/175ºF until the core of the meat has reached the same temperature of 57ºC/135ºF, basting the meat now and then to avoid drying it out. Using such a low oven temperature will prevent the outer part of the pork tenderloin to become overcooked. If you look closely at the picture above, you can see that close to the crust the meat is whiter than the pink center. This meat is slightly overcooked from the pan searing. If you were to finish the meat in a oven of say 180ºC/350ºF, the meat would be cooked more quickly, but a larger part of it would be overcooked and only the very center would still be pink. Learning to cook is about experimenting and learning from your mistakes. 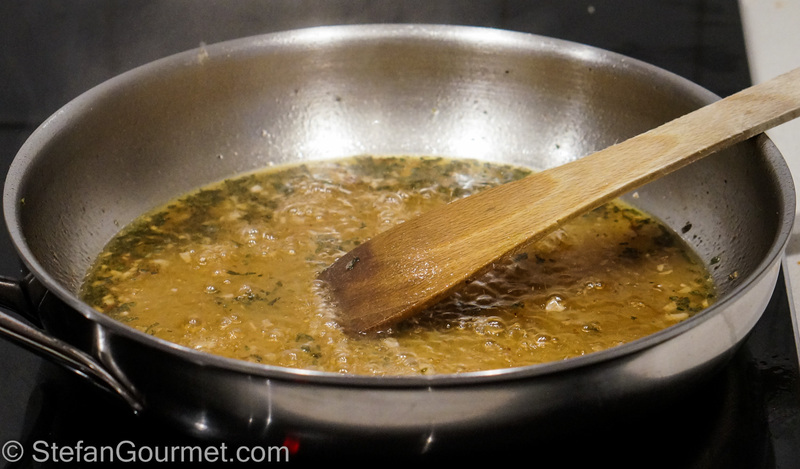 If you look closely at the picture of the finished dish, you see that the sauce has separated into a dark brown part and a light yellow part (which is the fat). 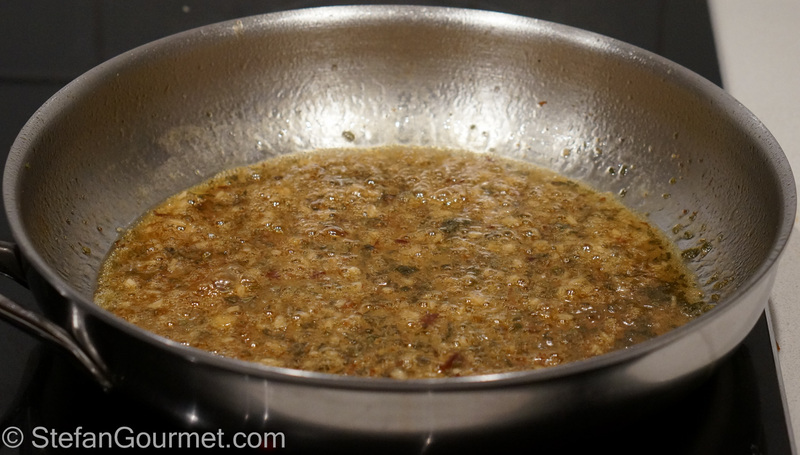 The sauce also is brown rather than golden as it is supposed to be (just compared it with the picture in this recipe). What you can’t see in the photo, is that the brown stuff is a very sticky caramel, impossible to eat. I could have discarded the photos I took, make this again for the blog (we wouldn’t mind eating this again, especially with the delicious sauce when it is made right) and pretend that my dishes always come out perfectly, but I decided to share this with you instead so you can learn from my mistakes as well. What went wrong? 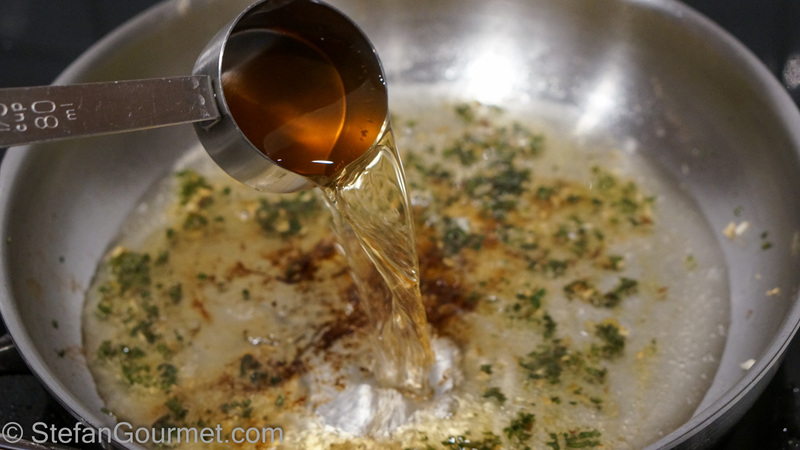 Well, the sauce in this recipe is a reduction of white wine, white wine vinegar, and sugar. It has to be reduced over medium high heat until it is thick and syrupy, and golden in color. Because it has sugar in it, it will go from golden to brown quite quickly so you have to watch it carefully and take it off the heat as soon as it is done. As I was busy slicing the pork tenderloin and plating it with the runner beans while the sauce was reducing, I wasn’t paying attention and left the sauce on the heat perhaps a minute too long. That’s what happens if you try to do everything as quickly as possible and if you get too confident. Even easy recipes require some attention to execute them right. This recipe only has about 15 minutes of active time and is delicious, so give it a try. You won’t be disappointed. Season the pork tenderloin with salt and freshly ground black pepper. 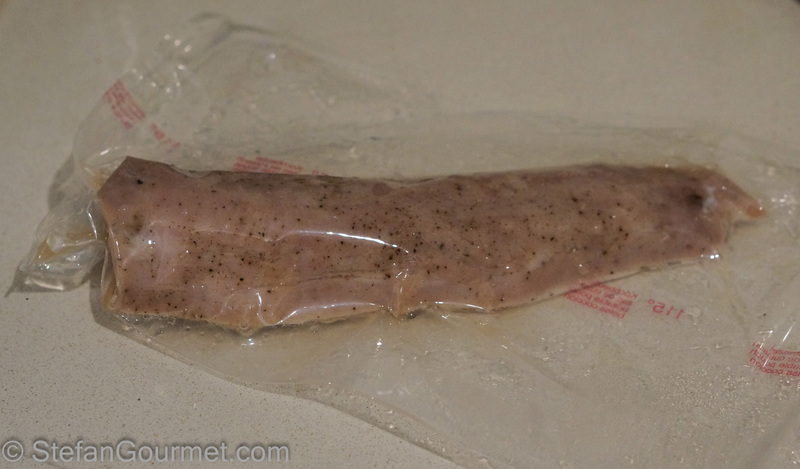 Vacuum seal it and cook it sous-vide for 1 hour at 57ºC/135ºF. This is hot enough and long enough to pasteurize the meat, so it will be safe to eat even though it will still be pink. It doesn’t look very appetizing when it comes out of the sous-vide cooker, because it hasn’t been seared yet. Pat the pork tenderloin dry with paper towels, and dust it with flour. 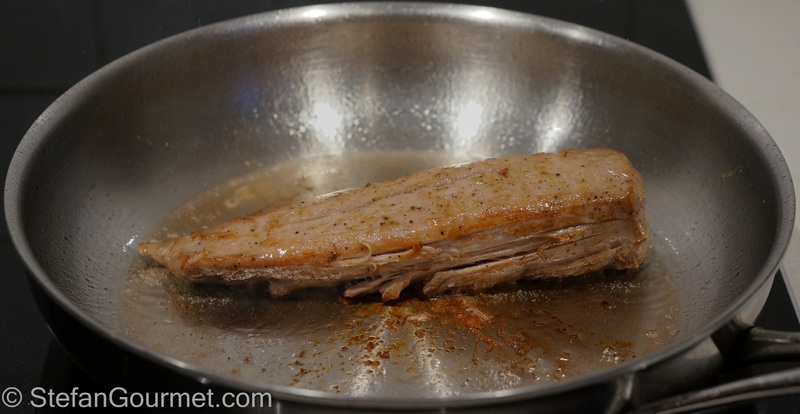 Heat the clarified butter in a frying pan and brown the pork tenderloin quickly on all sides over high heat. Turn off the heat, wrap the pork tenderloin in aluminum foil, and allow it to rest while you finish the sauce. 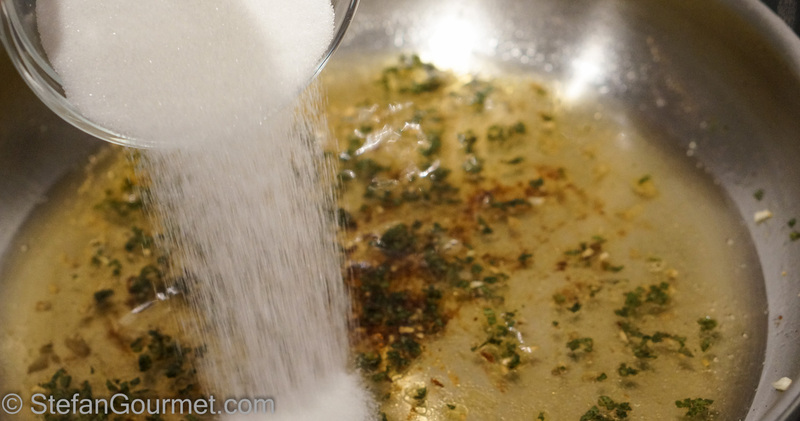 Add the olive oil, garlic, and sage to the pan and stir for a minute. The pan should still be hot enough, but you can turn the heat back on if needed. Make sure the garlic doesn’t burn. (I forgot to take a photo of this step. My game was definitely off — perhaps caused by the jetlag as I had just landed after 16 hours of traveling home from Miami Beach. 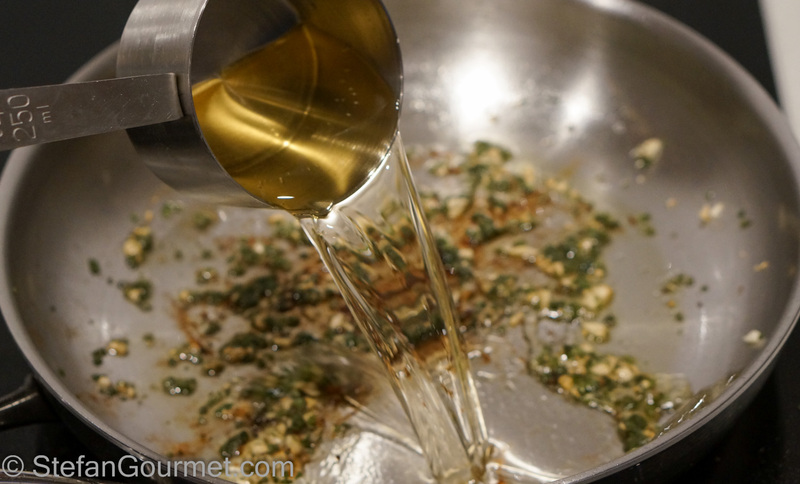 As soon as the garlic starts to color, deglaze the pan with the white wine. …and the sugar as well. Now turn on the heat to medium-high and use a wooden spatula to scrape all the tasty brown bits off the bottom of the pan to include their flavor in the sauce. Slice the pork tenderloin and plate it with some vegetables and the sauce on warm plates. Finish the meat with a bit of salt. 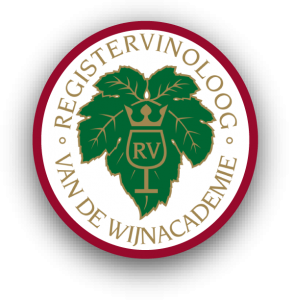 The sweet & sour sauce is great with a white wine that can stand up to it, such as a riesling auslese with some residual sweetness. 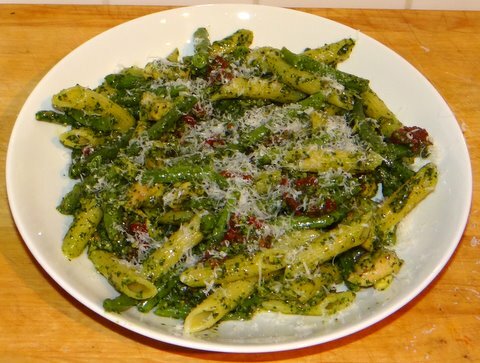 Two years ago on this blog was pasta with chicken, pesto, haricots verts, and sundried tomatoes. I created this Italian-style dish myself a long time ago, and I still prepare it because it is so tasty. The closest traditional Italian dish is from Liguria, but that doesn’t contain chicken and sundried tomatoes. This is a great dish, especially if you make your own pesto from scratch. Beautiful! I honestly can’t believe you’re already blogging! You’ll be happy to know that I just made duck breasts sous vide! And they were fabulous! Glad to hear your duck breasts turned out well. Are you going to do a post on them? Yes, I am. they turned out beautifully. I served one to myself with a dried fruit sauce, and then I served leftover duck on a salad when a friend came over. Fabulous flavor! I promise I will still make salmon. my husband won’t eat duck or salmon, so i have to wait until I have company!!! Cant resist pork tenderloin. Although never tried pork pink, I’d love to try one day. Great recipe Stefan! Give it a try! If you truly like pork tenderloin, you’ll love it. I can see why the pork is so moist from this preparation. I have always been intrigued by pork loin. I like that you talk about how to cook food sous-vide without a machine. The (perfectly reduced 🙂 sauce would be lovely on any number of proteins. Beautiful recipe, and plating, too, Stefan. I think you could do a pork-free version with a chicken or turkey roulade. Now that’s a thought. 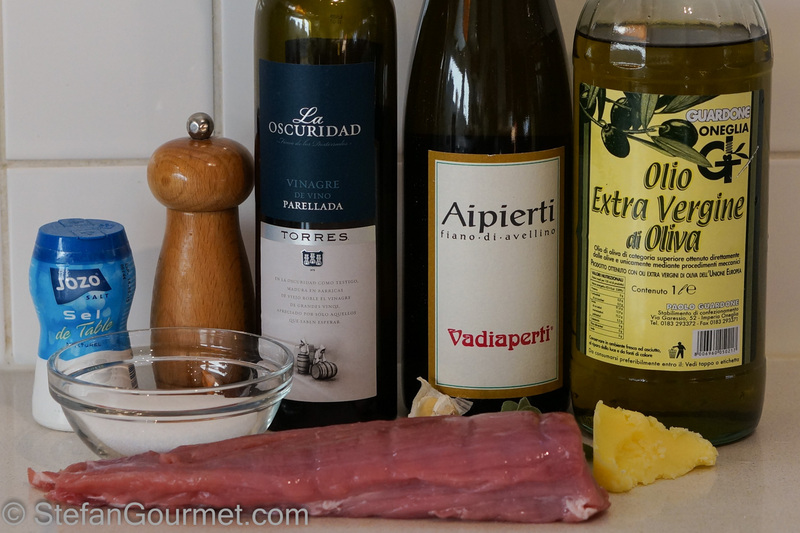 How does pork tenderloin taste different than other white meats? Is the texture similar, as well? When cooked like this the texture is more tender and juicy than chicken breast or turkey breast. The taste I can only describe as porky, which I know doesn’t mean much to you. Great to hear that you liked it. You probably used a higher temperature than I did, as I remember you like your pork a bit more cooked? Wow…the pork looks so tender and juicy.